What it’s about: Baseball is Henry Skrimshander’s life. His bible is The Art of Fielding by Cardinals shortstop Aparicio Rodriguez. It teaches him to be a leader, to play with intensity and calm, and to never, ever make an error. What Aparicio’s book can’t do for Henry though is get him out of the no-name club team in Peoria with a losing record. For that, he needs Mike Schwartz, a college ballplayer and unofficial student coach who catches Henry’s postgame practice after a local summer game. Mike sees talent in the scrawny, underweight kid, so much talent that he practically promises Henry a scholarship to Westish College in northern Michigan, a promise he delivers on. At Westish, Henry develops under Mike’s training regiment of grueling stadium runs at 5 am and Powerboost shakes with every meal. Soon he’s in the running the break Aparicio’s streak of errorless games. Until he makes a terrible mistake. I know that synopsis makes it sound like this is a book about baseball, but it really isn’t. Well, it is, in the sense that it centers on a team of college players. But the book is bigger than the team and spends a lot of time off the field and outside of the gym. We see Mike’s struggle with pain after years of back-to-back football and baseball seasons that have ruined his knees and his resistance to being a coach (those who can’t coach) even though it’s the thing at which he excels. We see Henry’s roommate Owen, a passionate eco-activist who clips a reading light to his cap in the dugout and whose afternoons with the university president develop from friendship into something more. At least half of the story revolves around President Affenlight, a Melville scholar who has dedicated his life to Westish College, his favorite place in the world, and who is reconnecting with his estranged daughter Pella, who is running from a failing marriage that started too young and falling for the friendly and appreciative Mike Schwartz. These five people form a tapestry, making this a human drama rather than just a story about sports. 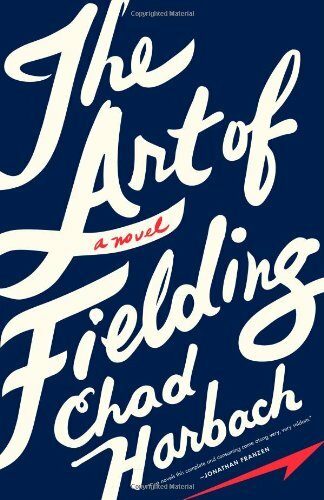 I’m not a huge baseball fan, so I wasn’t particularly excited to read this book, but I’d seen so many good reviews that I decided to give it a chance. I’m glad I did. The book is brilliantly written with flowing prose and nuanced characters. I flew through each chapter, enjoying the different voices and the care that’s taken to balance thought and action. The story is thoughtful but exciting, has depth but also simplicity. It has the emotional scope of The Corrections with none of the cynicism and a ton of heart. Would I recommend? Definitely. If you’re not a baseball fan, don’t be discouraged! Sports is really just the entry point to a complex and moving story about five people trying to learn who they are and who they want to become. Don’t miss it!